The Royal Mechanical Exhibition operated by Thomas Weeks at 3, Tichborne Street, Piccadilly, London, was established in about 1797. 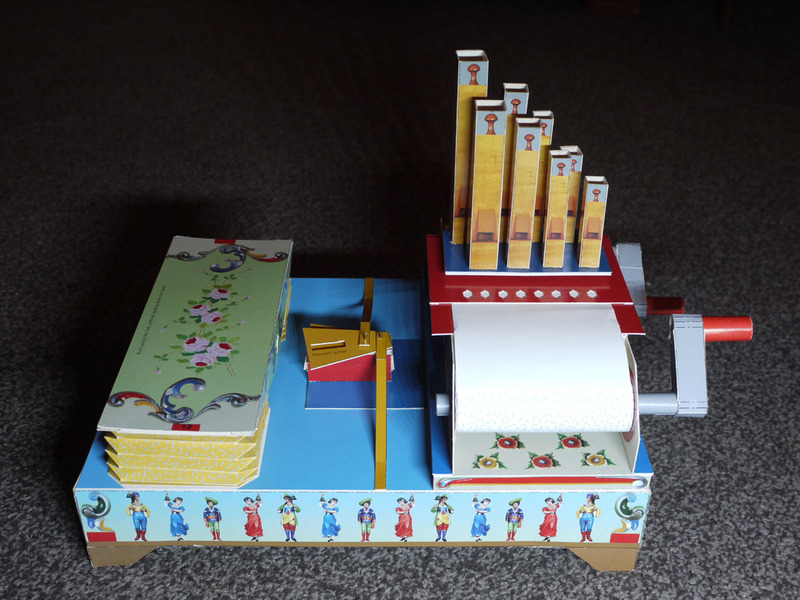 The exhibition included a variety of fine automata, some including music, and was open for public viewing with an admission price of one shilling (5p). Amongst the attractions was a mechanical spider, birds of paradise, clocks and other wonders of the age. An adjacent shop made it possible for admirers to order and purchase items similar to those they had seen in the exhibition. Upon the death of Weeks, the collection was dispersed by auction in 1834. 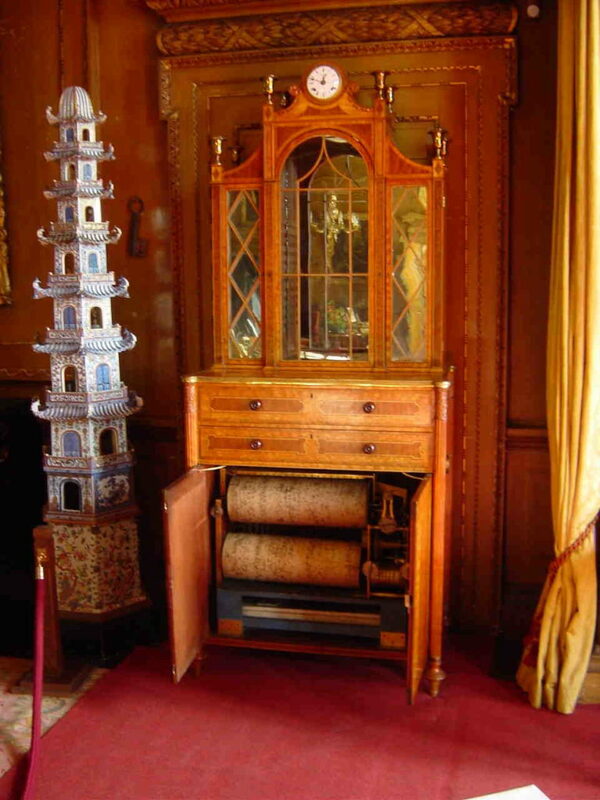 One of the so-called Weeks Cabinets forms part of the collection on display at Raby Castle near Staindrop in County Durham. The silver fitments date the piece to around 1801 and are engraved with the Vane family crest: it has passed by descent from the Earls of Vane to the present Lord Barnard. 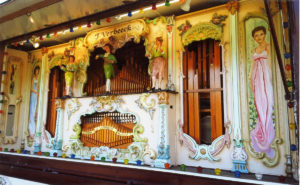 As can be seen from our photograph, the lower compartment contains a 19 note barrel organ which can be set in motion at will, or released automatically by the clock which is located at the very top of the cabinet. When we were commissioned to restore the organ, it had not been playable since at least the 1930s. The work necessitated repairing and re-leathering the bellows and wind chest. The four ranks of metal organ pipes also needed extensive repairs; two of the ranks form a ’forte’ register activated automatically by the barrel. Many problems had to be overcome to restore the complex spring-driven clockwork driving motor and several damaged and missing components had to be newly-made. Two pinned barrels are present, each containing twelve tunes. 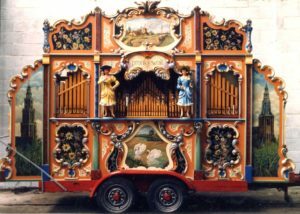 Hear the Thomas Weeks clockwork barrel organ, at Raby Castle, play “God Save The King”. (Workshop recording Kevin Grunill, used by permission). Since the restoration was completed, the organ has been regularly played for visitors to Raby Castle and to ensure no problems arise, the instrument is periodically checked over before the start of the season. In the past few days, Russell Wattam has again visited the castle for this purpose to ensure that everything is as it should be with the organ.